On our third day of venturing into the South by Southwest jungle of music, noise, food, and people, we were ready for a bit of a low-key day to regroup before the weekend really kicks off. Aside from seeing a few bands and enjoying a few beverages, we made it over to one of Top Chef-winner Paul Qui’s East Side King food trucks at Shangri-la. 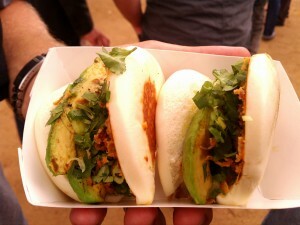 James had the Avocado Buns – delightful vegetarian snack sandwiches consisting of a Chinese bun stuffed with grilled avocado, crunchy onions, cilantro, scallions, and some spicy mayo. As you would expect, they were delicious! Now that we’re well-rested, tomorrow we’ll be out working at the Johnson’s Backyard Garden produce stand at Sustainable Food Center‘s downtown Austin farmers’ market. If you’re in town, come out and say hi to us!